Given the pressing challenges educators face each day, it’s easy to get caught up in the day-to-day fires and priorities and lose sight of where you’re trying to get. Unfortunately, good intentions are not enough when it comes to driving and sustaining growth. So where do school leaders begin? 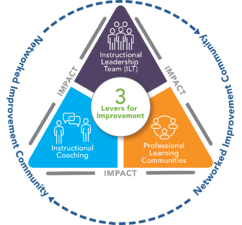 While there are many factors that go into successful school improvement, we’ve identified three levers that research and on-the-ground experience tell us create systems for investing in teachers and school leaders. How do I know (or predict more confidently) when a change will lead to improvement? How do I maintain focus in the face of so many competing priorities? How can I retool existing structures to create a learning organization that gets better at getting better every day?